AUTHOR INFORMATION: Paul McEuen is a Physics professor at Cornell University, He has completed his BS degree from U. of Oklahoma, then got his doctorate in Applied Physics from Yale, and did his post doctorate research from MIT. He has received numerous awards for his research, including the Agilent Technologies Europhysics Prize, a Packard Fellowship, and a Presidential Young Investigator Award. He lives with his wife and five dogs in Ithaca, New York, this is his debut. The movie rights to Spiral have also been optioned. CLASSIFICATION: This book is a techno-thriller in the vein of books by Michael Crichton, James Rollins and Douglas Preston. Spiral manages to give the readers a tale based on the premise of a relatively unknown fact from World War II. 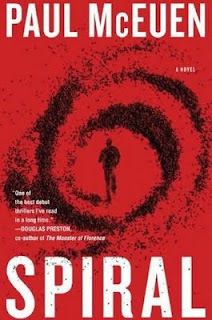 FORMAT/INFO: Spiral is a thriller with a standalone plot. It is 312 pages long divided over a Prologue, an Epilogue, and fifty-four chapters which are spread over six sections designated in days. Narration is in the third person via Liam Connor, Hitoshi Kitano, Jake Sterling, Maggie Connor, Lawrence Dunne and Orchid the assassin. March 22, 2011 marked the North American hardcover and e-book publication of Spiral via Dial Press, an imprint of Random House. OVERVIEW/ANALYSIS: Over the last few years I haven’t had much success in reading anything interesting in the techno–thriller genre. When I came across the blurb for the new techno-thrill novel Spiral, I was curious to see how this book would fare with the author’s credentials and the plot’s slightly unique background involving Unit 731 of Japan during World War II. Spiral begins in March of 1946 near the Pacific Ocean, when Liam Connor is newly inducted into the American troops. He is on a ship which houses a Japanese detainee, a kamikaze soldier by the name of Hitoshi Kitano. Liam is asked to find out a secret this detainee might have. Liam is quickly able to extract the secret from Hitoshi and continues on in an effort to make sure the plans Hitoshi had; do not fall into place. The book then advances by sixty-four years. Liam Connor is now a professor at the respected Cornell University where he has shared stage with the great minds of the 20th century like Watson, Crick and Einstein. He also loves to spend time with his grand-daughter Maggie and his great grandson Dylan both of whom share a decent amount of his fascination with Fungi. Jake Sterling is his protégé of sorts and a research collaborator; he works as a professor of nanoscience and is also an army veteran. His collaboration with Liam Connor has resulted in a sophisticated form of nanorobots called crawlers and it is these very crawlers which form one of the two main cornerstones of the plot. The actual plot starts with Liam Connor working alone in the laboratory as per his usual work habits. However on this particular day things are different as there is someone else waiting in the lab wanting to have a private chat with Liam. Orchid takes Liam prisoner and inquires about his participation in the events that occurred during the prologue. She relentlessly tortures him while he refuses to indulge any specific details. Orchid then causes Liam Connor’s death while trying to extract the secret behind the events in the prologue. Before his death, he however does manage to leave clues for Maggie and Jake to figure out the reason he died and whatever Orchid is searching for. Orchid goes forward with another part of her plan which is to get to Hitoshi Kitano and to make him atone for his World War II crimes. The secret that surrounds the majority of the novel, also comes into prominence, as Lawrence Dunne, the presidential advisor also wishes to get his hands on it and perhaps rid himself of Hitoshi Kitano with whom he shares an acquaintance. The tale constantly switches the POVs as we get to see all the sides struggling and jockeying to clear the web behind Liam’s words and find out where and what is the secret. The prose is very smooth for a debut author as the reader is exposed to some new concepts and intriguing historical detail. The technology and historical facts mentioned in Spiral have not been used in recent fiction novels and readers who might be jaded with the same “hidden treasure/bloodline/secret identity” plots will find a new and interesting element brought to this genre. The author has to be commended for integrating fascinating scientific aspects (eg. nanoscience, fungi) in with the book’s plot and keeping it simplistic enough for readers to wade their way through it. There are various factoids inserted in the prose to surprise the reader from time to time and I enjoyed reading them. The book is fast paced with the opening pages detailing the background of the main characters and the death which kick-starts the main plot. The readers will constantly feel the need to keep on turning the pages to see what happens next as the author keeps on upping the tension for the characters on a individual character level as well as group level. As with almost every thriller there is a bit of a predictability factor that is present in this genre and Spiral does not differentiate itself from that predictable nature. The plot first unveils the secret and then there’s a quest to get it. This plot structure is time-honoured and a vital component of this sub-genre and it is present in this novel as well. The author does well to mark himself from his luminous predecessors in this part by not making the tale overtly predictable. There are a couple of plot twists which would difficult for new readers to the genre to anticipate but the most experienced readers will probably be able to figure them out. CONCLUSION: A good debut by professor Paul McEuen who showcases some deft writing skills along with a cool plot to give us a smooth techno-thriller for jaded fans of this sub-genre. If you are interested in learning a bit more about World War II Japanese tactics and the future worries of nanorobots then this is the book for you.